Denmark has a unique Metal scene, and it gave birth to three legendary giants: MERCYFUL FATE, KING DIAMOND and ARTILLERY. There were others, like MALTESE FALCON in the 80’s, and others that I can’t remember their names (and I’ll not search just to play dumb with you all). But it’s truly rare to hear something new from those lands. But once in a while, new names appear, as from the quintet BLACK SWAMP WATER, that is releasing their second album, “Distant Thunder”. To explain in few words: they are a Heavy Metal/Hard Rock band with its music molded by a Southern Rock feeling. Ok, my words are not enough to explain how lovely and melodic their music is, and what great melodies that fills every song, turning the album not only easy to be assimilated by our minds. Of course, the greasy feeling of Southern Rock is presented in homeopathic doses, but making their music even better. What I’m trying to say: this album is really good! It’s like AMORPHIS mixed with CORROSION OF CONFORMITY in some moments. Christian Bond Sørensen and the band took the responsibility to produce, mix and master the album’s songs. It’s clear in a way that we can understand every little musical arrangement they play and to absorb their melodies, but it’s heavy as well. To be honest, their music sounds great and fresh, being far away from those moldy qualities we hear every single day. Their musical work is really lovely, and although the entire album is very good, the heavy weight of “Bitter Harvest” with its fine guitar riffs, the nice melodies and excellent work on bass guitar and drums of “Live Your Darkness”, the fine mix of melodies and aggressiveness heard on “Rebellion” and on “The End”, and the charming melodies of the introspective “The High Road” and “Defiance” (where the vocals are showing their versatility on both) will conquer you all. 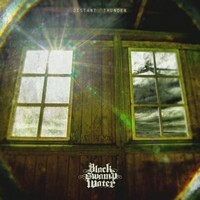 So “Distant Thunder” is a very good album, indeed, and BLACK SWAMP WATER is going to be a strong name of this genre, if they know how to deal with their musical work.